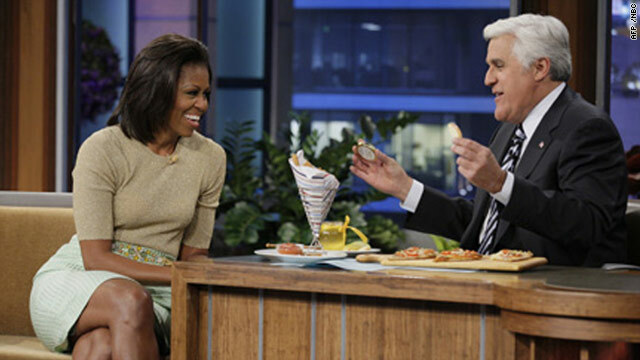 “They're doing really well and I think that's been one of the most surprising things about living in the White House and probably one of the things I've worried most about was whether we could have a normal life,” she told Leno in a video clip released by NBC. “The people at the White House are amazing, the girls are good, they're normal, we always check in, they have a regular life. They've got friends and sleepovers, and to them its home. It's been truly a blessing for us,” she said. 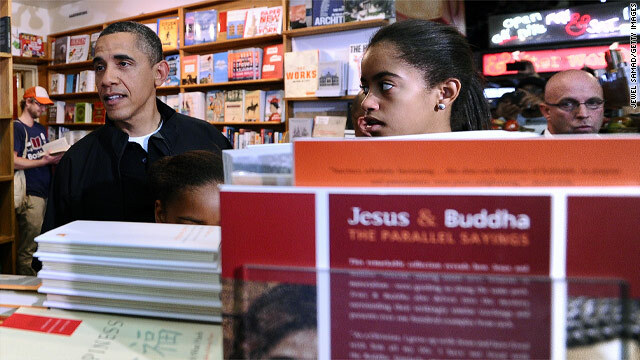 US President Barack Obama and his daughters Malia and Sasha shop for books at Kramerbooks and Afterwords, a local bookstore, in Washington. On one of the busiest shopping weekends of the year, President Obama and first daughters Sasha and Malia dropped by a local area bookstore in support of the 2nd annual Small Business Saturday. The First Family, known for their bookstore outings provided some Thanksgiving retail therapy to Kramerbooks & Afterwords Cafe in Washington's Dupont Circle neighborhood. The family was dressed casually, with both girls wearing jeans. The visit didn’t seem like a spur of the moment decision, since the area in front of the store had been cordoned off with yellow police tape. The President and first daughters were greeted with applause, as some stunned shoppers stopped in their tracks at the scene of Secret Service and travelling Media in the crowded bookstore. The First Family browsed together, spending time in the travel/writing section of the trendy bookstore/restaurant known for its eclectic variety of books. The President greeted 5-year old Alexander Lee Mussehl at the behest of the youngster’s Grandmother, Susan Lee of Washington. Obama asked Alexander if he was doing some Christmas shopping. The President then responded for him “Well, we're starting early. This is 'Small Business Saturday.' So we're out here supporting small business." Daughter Malia, loaded down with an armful of books, also said hello to young Alexander. The White House provided this list of the books purchased at the shop by the first family. Not only is it the United States of America's 235th birthday, it's also First Daughter Malia's 13th birthday. There's officially a teenager in the White House once again. She's just three years away from getting her driver's license! Happy Birthday, Malia from your friends at the 1600 Report! We hear there's quite a celebration at your house tonight! On the U.S. elections: "We really don't talk about the election. We're really doing the work, and that's an important and useful distraction in the midst of it. There's a lot on the president of theUnited States' plate that keeps him focused on what needs to be done, so you just keep doing what you believe is right. I always say this: One of the reasons why I support this president and not just as my husband, but as a citizen, is because I see him taking that long view. I see him every day waking up worrying, not about polls, but worrying about what is the right thing to do for the future. That keeps you pretty focused on what's important." On husband's campaign: "When it comes to the campaign we're ready to work hard. 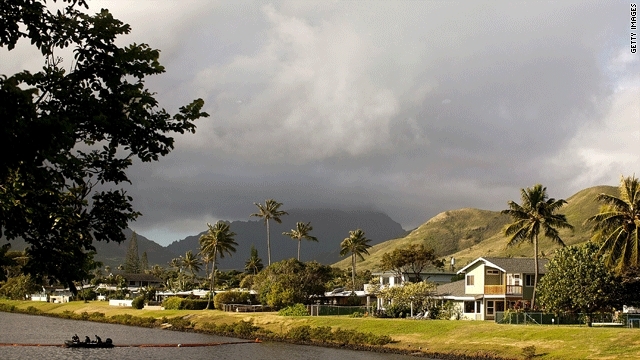 We did it before and we'll do it again, so we're rolling up our sleeves and getting on with it." On daughters: "Fortunately, we have help from the media. I have to say this: I am very grateful for the support and kindness that we've gotten. People have respected their privacy, and in that way, no matter what people may feel about my husband's policies or what-have-you, they care about children, and that's been good to see." 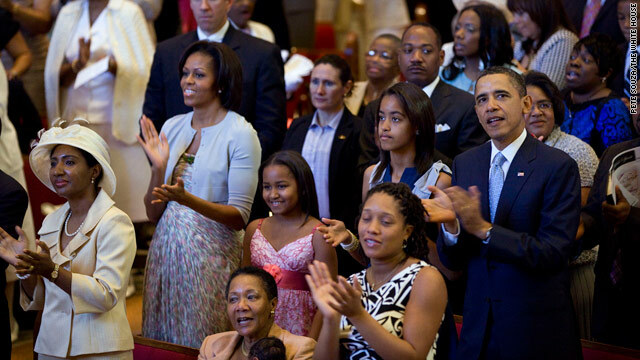 President Barack Obama, first lady Michelle Obama, and daughters Malia and Sasha attending Easter church service at Shiloh Baptist Church. 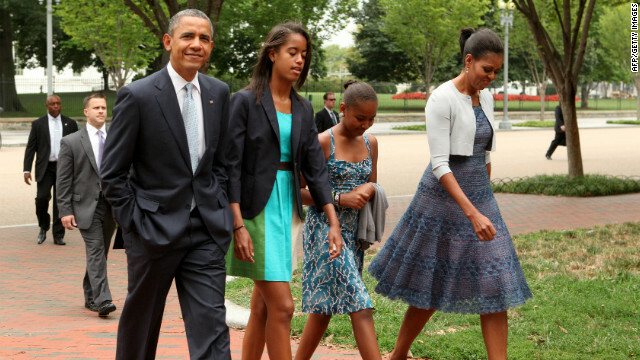 WASHINGTON (CNN) - Dressed in their Easter Sunday best, President Obama, the first lady, and daughters Sasha and Malia entered Shiloh Baptist Church in Washington Sunday to a standing ovation. The first family attended the 10 a.m. Easter service, a rare public appearance at a church for the president. Rev. Smith, the senior minister of the historic church, welcomed the Obamas. "It probably has not been lost on you that we have some very special visitors this morning... so we welcome President Barack Obama, Michelle, Malia and Sasha." With his arm around his daughter Malia, President Obama sang along as the 120-member choir performed the introit, This is the Day, and an opening hymn. The service also included scripture readings from the Old Testament (Jeremiah 31:1-6) and the New Testament (John 20:1-18). 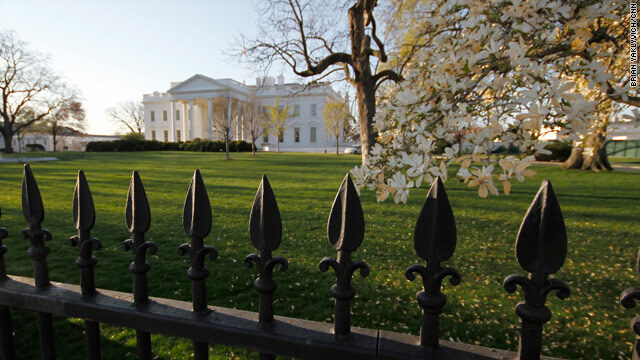 (WASHINGTON) CNN–As last minute negotiations continue to avert a government shutdown set for midnight Friday, the first family has cancelled a planned weekend getaway to Williamsburg, VA. The White House announced late Friday afternoon that “The President will remain in Washington, DC this weekend as he continues to work with Congressional leaders to reach an agreement on the budget. The First Family’s trip to Williamsburg has been postponed.” Williamsburg is 150 miles south of Washington, DC and was the 17th century capital of the colony of Virginia. In 2005, Queen Elizabeth and Prince Phillip visited the area to commemorate the founding of nearby Jamestown, the first permanent English settlement in America. THE PRESIDENT: I have my two trusty assistants here - (laughter) - Malia and Sasha for one of the most important duties that I carry out as President. My how she has grown! 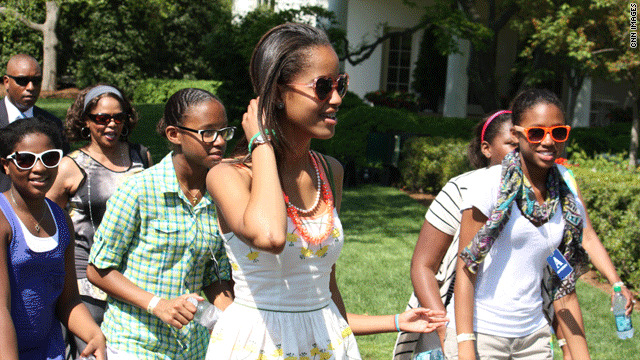 First daughter Malia Obama is a tall 12 year old.